Since I've been looking over items for baby I realized there was an area that a lot of mommies use that I haven't shown on the blog. This is mainly because my experience with it was for about 3 days total while Jack was on a feeding tube. Then we switched to nursing, so I haven't had the need to use this household item, but know lots of my mommy friends (maybe you're reading) use different formulas. Read the comparison of the two brands based on ingredients here. **Taboo Topic Disclaimer - Before I get comments from both camps about nursing vs. formula, I just want to say that I'm offering this as a general review based on research for Similac and personal use of Baby Only for a short time. I'm a strong advocate of nursing, but also understand that some women choose not to or they simply cannot for many different reasons. I'm not here to put my stamp of approval or dissaproval on either as this is a personal choice of every mother! :) **ok, there's it is. Onward! It is formulated to provide essential fatty acids, vitamins, minerals, protein and carbohydrate needed to support normal growth and development. 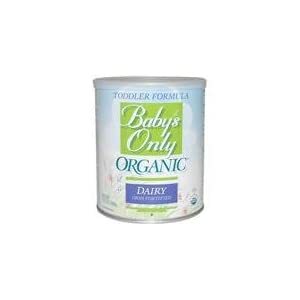 Baby's Only Organic is the only formula made with certified organic ingredients. Organic is your assurance the ingredients are not genetically modified or engineered. All certified organic ingredients have been grown and processed without harsh chemical pesticides and processing aids. The formula uses organic non-fat milk from farms where bovine growth hormones, antibiotics and steroids are prohibited. It is formulated for easier digestion and provides complete nutrition for a baby not found in goat or cow milk. Organically grown/processed in accordance with the California Organic Foods Act of 1990. Additional Nutrition Facts - One serving also provides: Choline 20mg and Inositol 8 mg. Pasteurized during processing to insure safety. Since there are varying formulas of Similac, I decided to break them up. I know that many friends use the sensitive formula as it is gentler than the regular. Similac Advanced Early Shield Infant Formula with Iron - 6-pack! Similac Sensitive Powdered Milk Formula - 23.2 oz. Lactose-free to avoid lactose-associated symptoms (eg, diarrhea). Overall, the organic formula I favor because of how the ingredients are handled and what is actually in the formula itself. The options given are based on good pricing I found through Amazon (you will find I purchase through them a lot!). Good luck on your pursuit of feeding your baby.